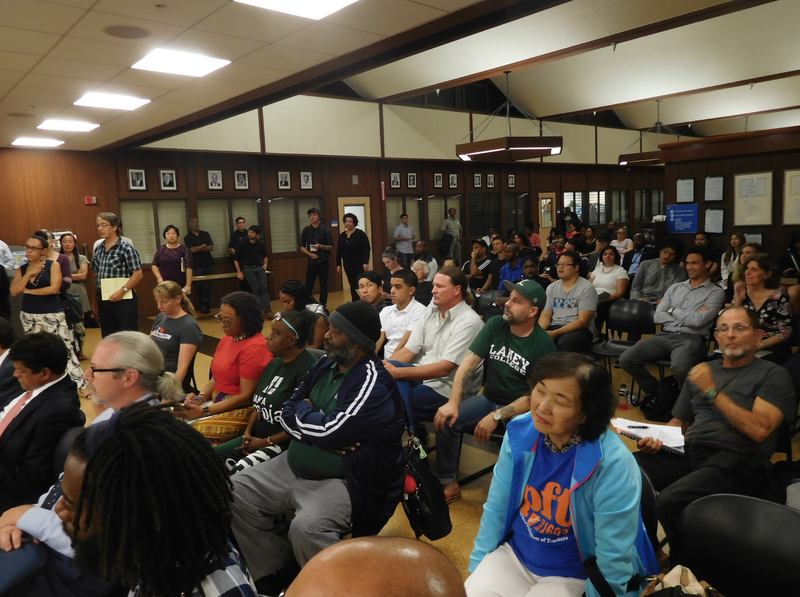 Critics fear the ballpark will displace Laney College and the surrounding community. Dozens of students, faculty, staff and community members turned out to address Peralta's board about the A's plan. It's been an open secret for months that the A's want to build their new stadium on a site next to Laney College, but on Tuesday night, Athletics President Dave Kaval made it official. In a letter to Peralta Community College District Chancellor Jowel Laguerre, Kaval wrote that the Laney site is a "clear priority" for the team. But at the Peralta district's board meeting, students, faculty, staff, and other members of the public voiced nearly unanimous opposition to the A's plan. "It would be devastating for the low-income communities we serve," said Kimberly King, a Laney faculty member. "We are hoping to prevent the A's stadium." "I'm a deep, deep — it's almost problematic what an A's fan I am," said Chris Weidenbach, an English teacher at Laney, before he explained why he's opposed to a ballpark on or near the campus. He said it would massively disrupt the campus' educational mission while gentrifying the neighborhood. "I can predict massive opposition," he told the school's board. Laney student Jabari Shaw said a ballpark would change the tenor of the neighborhood, bringing party-goers, public intoxication, and numerous other problems to the campus. Roger Porter, another English teacher at Laney, told the Peralta trustees that Laney college has helped thousands of people transform their lives, including formerly incarcerated people. He doubted that a ballpark can coexist with the community school. "I think we need to reserve this space for Laney as a place where people can transform their lives," said Porter. "I have students from the penitentiary. "The A's are a corporation. They're in the business of making money. We're in the business of transforming people's lives," added Porter. And activists from Oakland's Chinatown voiced fears that a new ballpark at Laney would wipe out immigrant Asian communities by displacing low-income renters and small businesses. Lailan Huen of the Oakland Chinatown Coalition told the board that in Washington, D.C., a sports stadium built near that city's Chinatown was one of the reasons the neighborhood was "completely obliterated." "We strongly oppose the A's on this site," said Huen. "The Chinatown Coalition will fight this tooth and nail." No one spoke in favor of the ballpark at Laney. "These concerns are critical to Oakland’s future and are bigger than any one neighborhood or development project. We believe there are ways to work with community groups and City officials to make sure that the new ballpark and any ancillary development lead to an inclusive and equitable set of outcomes in the long term." "The A’s are committed to engaging with community leaders to think creatively about ways this project can maximize opportunities for new mixed-income housing, workforce training, living wage jobs, and small and local business investment. We also believe there are immediate interim land use controls and other policy measures that can be put in place to protect against displacement and speculation in the short term." But opponents of a ballpark at Laney College are skeptical that the project can coexist with the school and the surrounding community as it currently exist. "No amount of mitigations can change the fact that a stadium will completely change the fabric of our educational and cultural gems," said Alvina Wong of the Asian Pacific Environmental Network at tonight's Peralta board meeting. The Oakland Athletics delivered a letter addressed to me shortly before tonight’s Board meeting. We want our community to be fully aware of the content of the letter, therefore I am making the letter public tonight. I want to make clear the following: No decision, no commitments and no deals have been made. The Governing Board will likely discuss this item when it reconvenes in October. I will be recommending that the Board rely on the Peralta Community College District’s strong participatory governance process, meaning we will invite our stakeholders—faculty, classified staff, students and administrators—to help examine this issue. The Governing Board will also do its due diligence to work with the community and the colleges to assess the impact on students, faculty, staff, the classroom environment, the community surrounding us, the residents of the area and the city overall. We must work with our community to develop a set of principles to frame our discussions. We continue to value the community that has supported the Peralta Community College District for almost sixty years.